Skin aging is caused by sunlight, pollution, cigarette smoke and genetics. A good anti-aging skincare routine not only encourages youthful skin growth, but also defends against these environmental factors. 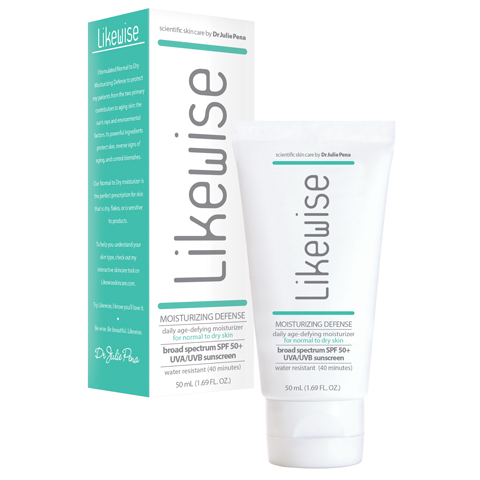 Likewise Skincare products are formulated based on five scientifically-proven ingredients, all components of dermatology's beauty pyramid. The base of the pyramid is comprised of ingredients that are the foundation of anti-aging skincare. Year-round sunscreen use can significantly slow the skin’s aging process by as much as 24 percent, according to the Annals of Internal Medicine. There are differences between sunscreen ingredients. The most effective ingredient is zinc oxide which blocks most of the sun’s harmful rays instead of absorbing them like other sunscreen ingredients. It even blocks the UVA rays that penetrate windows when you are indoors or driving in a car. Likewise Moisturizing Defense contains 11.6% zinc oxide for superior sun protection. Antioxidants such as vitamins C, E and natural soy protect against oxidative stress from pollution and smoke. The result is new collagen growth, diminished appearance of fine lines, and more radiant skin. The pyramid's center represents ingredients that rejuvenate aging skin. Dermatologists have known for a long time that retinoids diminish fine wrinkles, lighten dark spots, and smooth rough skin. Retinoids work by increasing collagen, regulating the skin cell’s maturation process, and dispersing dark granules in the skin’s cells. Studies have shown that for anti-aging purposes, 1% retinol is as effective as prescription retinoids. 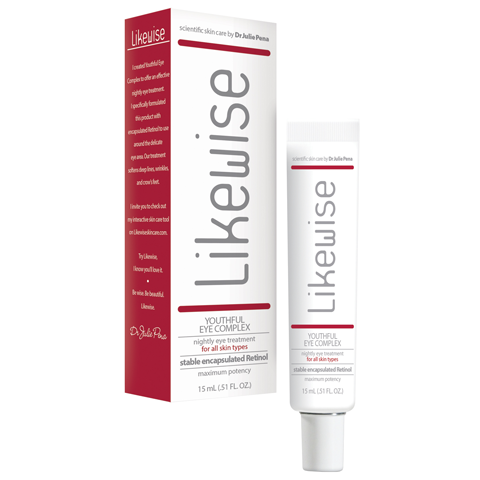 Likewise Age-Defying Wrinkle Smoother contains 1% retinol in a calming blend which minimizes the irritation that can be experienced when applying vitamin A products. To improve the appearance of eyelids, a gentler retinol is available in Likewise Youthful Eye Complex. Alpha hydroxy acids (AHAs) enable the skin to retain moisture and exfoliate the skin’s surface cells. The skin appears smoother with a youthful glow. 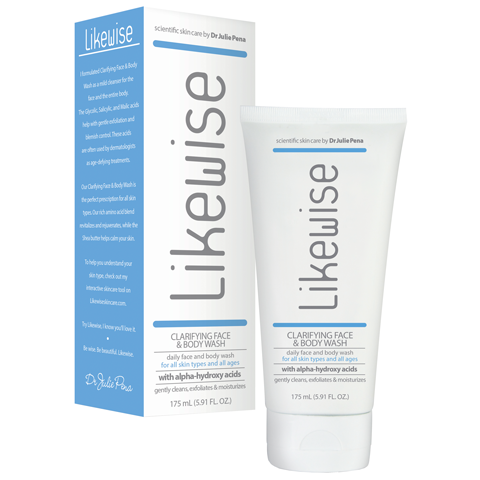 Likewise Clarifying Face and Body Wash contains powerful AHAs in a skin-calming blend. When striving to reverse photodamaged skin, studies have shown that both AHAs and retinoids should be included in a daily skincare regimen. The peak of the pyramid is reserved for promising technology. Peptides and growth factors, proteins that stimulate the growth of living cells, are newer anti-aging technologies which show promise. 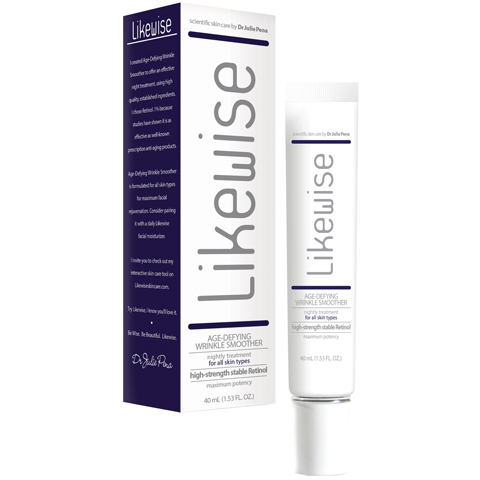 Likewise Youthful Eye Complex contains peptides along with many other ingredients that help minimize fine lines and wrinkles.